The winter season is in full force, and that means that your home is in danger of having problems if you are not prepared for cold weather. Your home needs care in cold weather too! 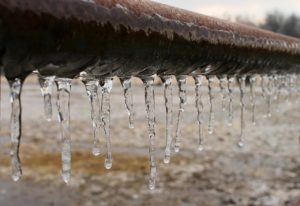 In this article, we’ll be discussing some of the ways to prevent frozen pipes and make sure that you are not having a waterproofing disaster this winter. When temperatures get low, it’s time to open up the cabinets in the kitchen and bathroom (or any place with pipes). Think about it—when you shut a room door in the winter and come back later, the heat from the rest of the home hasn’t reached it because it can’t circulate easily. That means that it’s very cold. This is a recipe for disaster when you have water pipes behind your cabinets. Not only are you risking a frozen or burst pipe, but you’re also risking a chunk of change to get it and your cabinets fixed once it breaks. Opening the cabinet doors will allow the warmer air in the rest of the home to get into the cool, dark area under the cabinets. This is especially true if your pipes are on an exterior wall. Make sure to remove your cleaning chemicals if you have any pets or small children. Once you have the cabinets open, move up to the sink and tub. Let cold water drip from the faucet in extreme cold. This will get some water running through the pipes. You may think this is counter-intuitive to saving money because it might make your water bill higher, but it will save you a lot of time and hassle that comes from frozen pipes. There’s no need for it to be a steady stream of water, just try a trickle of water. You can also place a space heater in the bathroom floor near the open cabinet doors. Never leave space heaters unattended. Make sure to insulate any exposed pipes. This is as easy as buying a few strips at the hardware store to wrap around your pipes. It may not look pretty, but it will save you from regret if the pipes freeze. Additionally, in the long term, it’s important to make sure that all areas of your home are insulated. This is true even in areas that you aren’t often in, like the basement. If there are any water pipes running through these areas, the room really needs to be insulated. Not only will this help keep your pipes from freezing, but it will also help you with heating costs because heat will not be escaping in these rooms. Need Advice for Frozen Pipes? If you’ve done everything above, and you’ve kept your temperature set to no lower than 55° F, you should have no problems with keeping your pipes free from freezing. Leave the temperature on the same during the day and night, even though it won’t help you with the heating bill. This will also help prevent frozen pipes. Have questions? Call My Foundation Repairs for a home inspection. « Why Should You Get a Home Inspection for Foundation Repair?